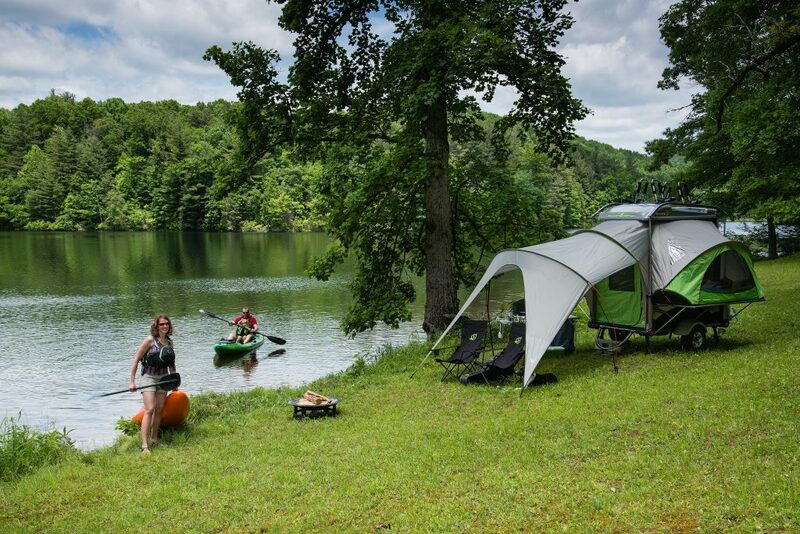 Are you ready to load up your truck and set off on an adventure unrestricted by campgrounds or hotels? 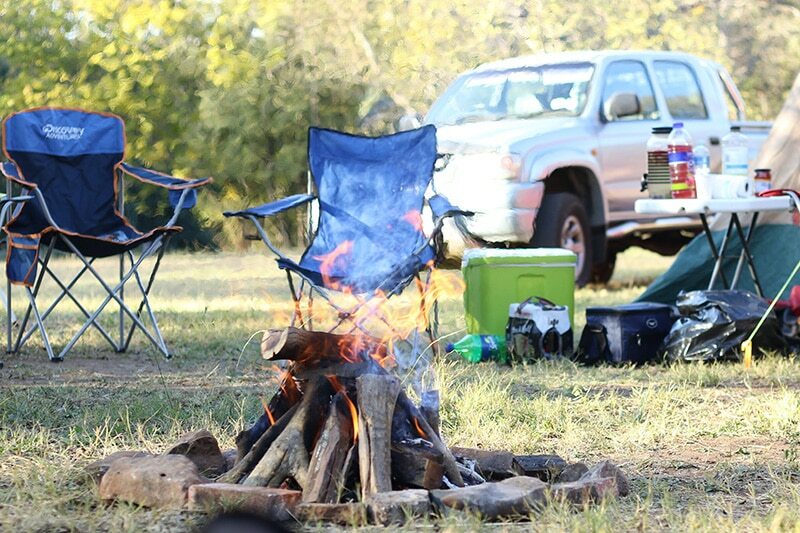 Truck camping gives you the unique freedom to drive wherever you want, set up camp at the most remote locations, and enjoy the outdoors from a completely fresh perspective. Truck camping has a minimal footprint, allowing you to camp at the best free and undisturbed campsites across the country. It is also one of the easiest and low-maintenance ways to explore the country. However, before you take off for your adventure, make sure you have the right tools and equipment to guarantee a safe and memorable experience. To an extent, your vehicle will dictate where and how far you can go. If you’re going off road, your vehicle should be equipped with four wheel drive, higher ground clearance, and all-terrain tires. An SUV is nice to have on longer trips due to its large storage capacity and ability to convert to an enclosed sleeping shelter. No matter what you’re driving or where you go, you need to equip your vehicle with the proper gear for a safe trip. Regularly check your spare to make sure it’s properly inflated and in good shape. If you have oversize tires, invest in a full-size spare so you can drive your vehicle back over any terrain, no matter where you have to change your tire. 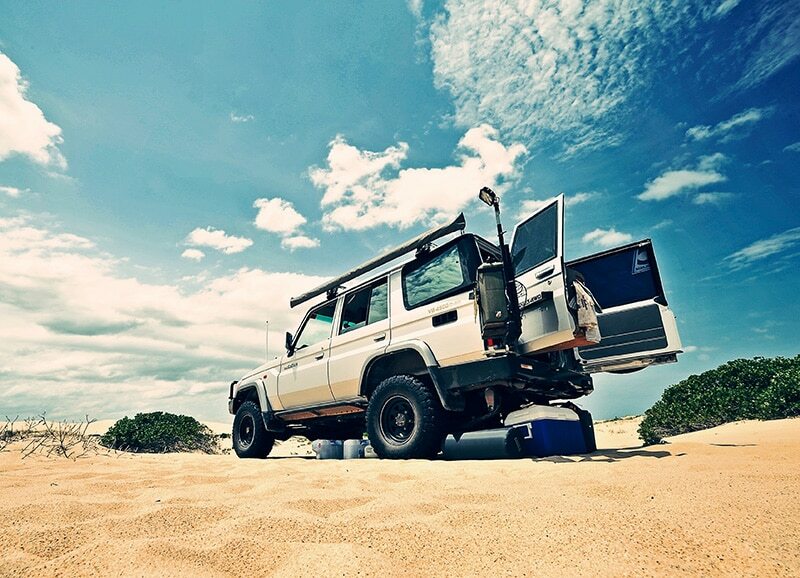 If your vehicle has high ground clearance, keep a larger jack on board to get you out of even the stickiest situations. It’s a well-known fact that things break when you’re using them. It’s important to have a set of essential tools on hand to perform repairs on the road. It’s also equally important to be well-versed in basic vehicle maintenance, since the closest mechanic can be hundreds of miles away from camp. Keep an emergency supply of fuel on board, should you become lost on your trip or burn through more fuel than expected. Always keep a gas can (or two) full, since there may come a time when you don’t know where your next fuel stop will be. 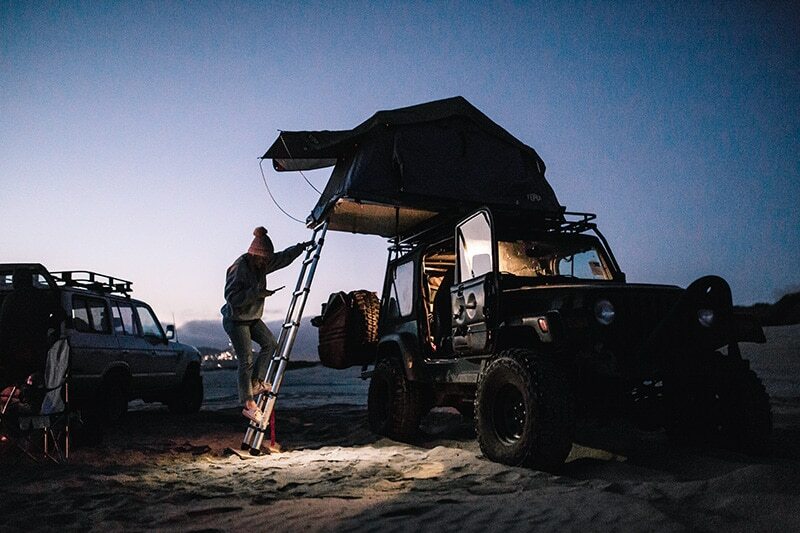 Whether it’s on your vehicle or in your hand, you’re going to need a good lighting setup to illuminate more remote camping areas. Many truck campers attach LED light bars and fog lights to their vehicles, and upgrade their headlights with brighter bulbs. It’s also smart to bring along a rechargeable lantern and plenty of batteries for your flashlights. Nobody ever plans on getting stuck, but you need to be prepared if it happens, especially if there is nobody around to help get you out. Equip your vehicle with a shovel, recovery straps, a small portable air compressor, and a tire repair kit. If you’re doing serious off-roading, consider installing a winch. Additionally, you might consider investing in a bull bar, especially if you’re doing a lot of driving at night in wildlife territory. There’s nothing worse than realizing your battery is dead after a long night of listening to music or leaving the lights on. Make sure to bring a set of jumper cables and a battery charger in case nobody else is around to give you a jump. You have several options when it comes to sleeping arrangements with a truck camping setup. Before you set out to buy the latest and greatest tent setup, it’s a good idea to make sure you like truck camping first. Start out with the most minimal setup, and work your way up until you find something comfortable for you and your budget. The simplest point of entry into truck camping is to just sleep in your truck. This is easier if you have an SUV or a large double cab where the seats fold down into a flat sleeping area. Sleeping in the truck requires no setup or breakdown. Just roll out your sleeping bag, grab a pillow, and get as comfortable as possible. This is also one of the safest setups, offering maximum protection from weather and wildlife. Sleeping in a standard tent is the tried and true way to camp. All you need to do is pitch your tent and inflate your air mattress, and you’re good to go. Tents and air mattresses don’t take up much room in your truck, so storage is not an issue. The biggest drawback to traditional tents is that you’re still sleeping on the ground. 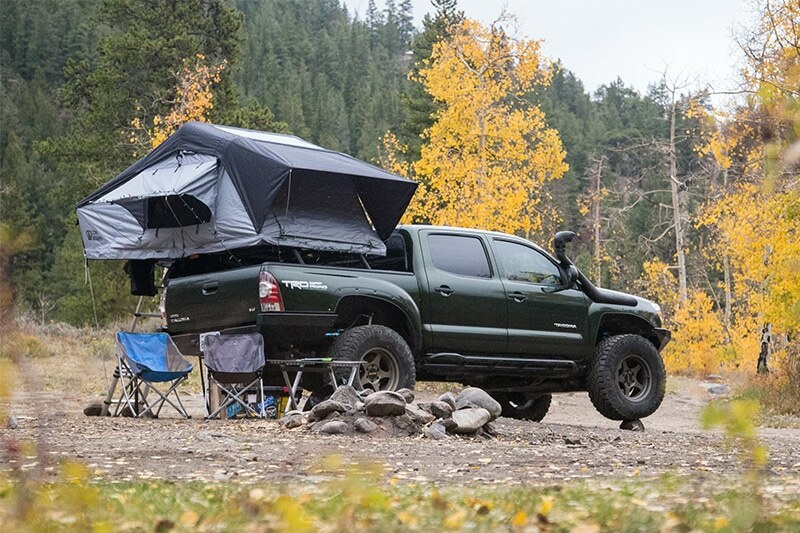 To simply get off the ground, look no further than a truck bed tent. 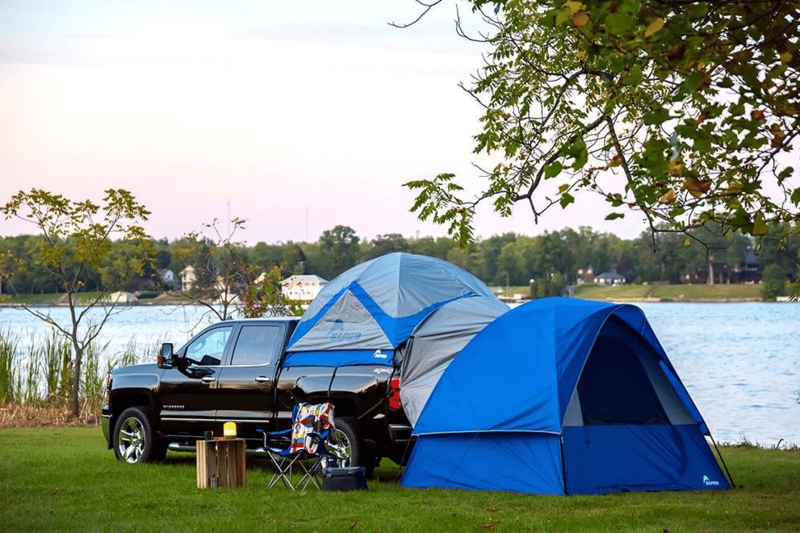 These tents pop up inside the bed of your truck, offering added safety, comfort, and protection. They’re an affordable option for campers who like the freedom of truck camping, but don’t want to spend a lot of money on a camping setup. Roof top tents work on both trucks and SUVs. They’re installed on top of a roof rack and require climbing a ladder to get inside, keeping you safely elevated from the elements and wildlife. Most rooftop tents fit two people comfortably, and come with a mattress pad inside the tent. 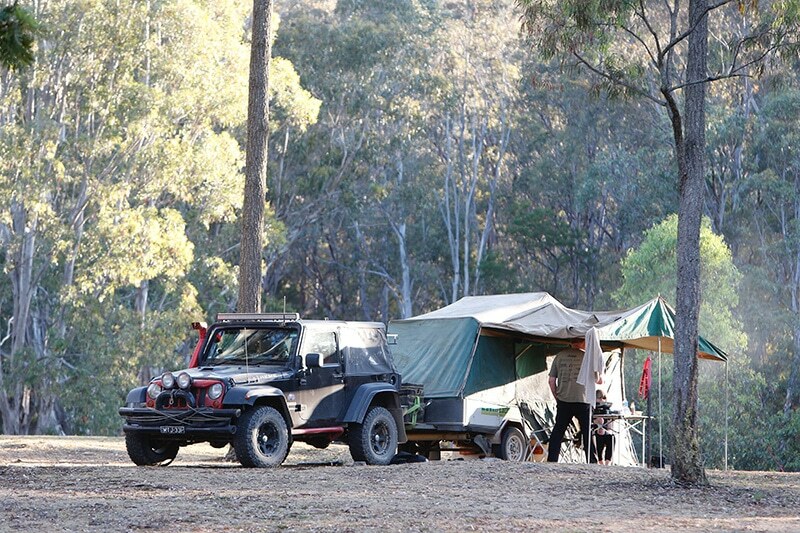 However, roof top tents tend to be the most expensive sleeping arrangement for truck campers. Large plastic bins and containers are great for dry storage. All you need are two bins: one for daily essentials like cooking supplies, flashlights, camping accessories, etc., and one for your food and pantry items. Plastic bins are cheap, easy to clean, and lightweight. Most campsites offer water spigots and hookups, but more remote areas will require you to bring your own water. 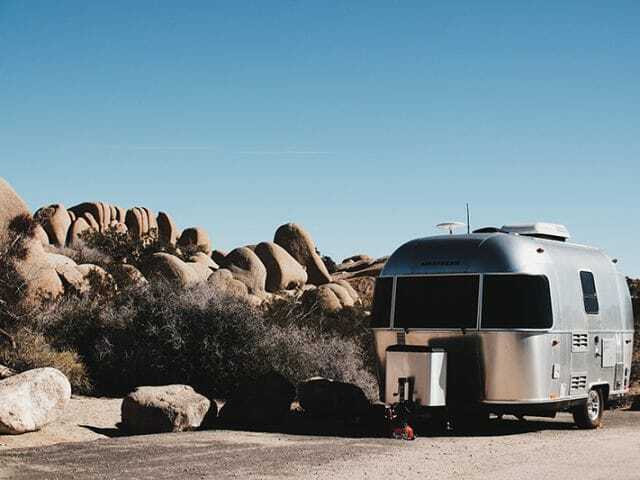 Depending on the length of your trip, you’ll need to carry a water tank with at least a gallon of drinking water per camper, per day. If you’re showering on the road, it’s a good idea to invest in a portable shower and keep five extra gallons of water on hand for cleaning up. You’ll need one or two coolers to start truck camping. One cooler is for your perishable food items, and the other is for ice, water, and drinks. Roto-molded coolers are almost essential for truck camping, due to their ability to hold ice for several days. To keep your food cold longer and save space, freeze water bottles before your trip and use them as ice packs. Invest in a decent camp stove for quick and easy home-cooked meals on the road. While you can survive on granola bars and sandwiches alone, nothing compares to bacon and eggs in the morning or a hot cup of soup in the evening. A nice two-burner stove doesn’t take up much room, and it’s a game-changer when it comes to cooking on the road. You can easily find propane while traveling, or just bring what you need from home. Stock your camp kitchen with the basics: durable set of utensils, non-stick pan, cast iron skillet, plastic cutting boards, camp lighter, and knife set. A meat thermometer is nice to have if you’ll be grilling out at campgrounds and picnic areas. It’s a great idea to invest in a flash cooking system for instant coffee and tea in the morning. Disposable dishes are convenient, but cost you space and money. Instead, buy a set of outdoor dishes for each camper and wash them when you get to your destination. If you’re in a remote area without access to running water, disposable dishes may be your only option. 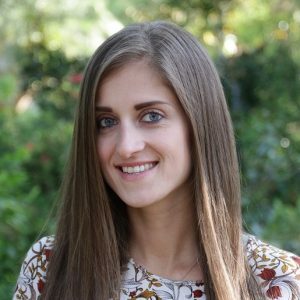 Use paper cups, plates, and biodegradable utensils to minimize your impact on the environment. 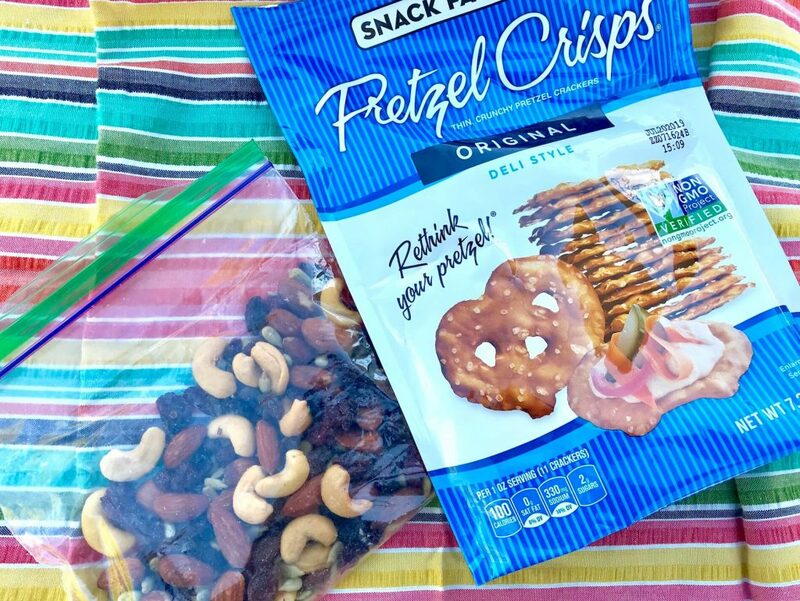 A camp emergency kit is more of an essential than an accessory. It can be the difference between life or death in an emergency. 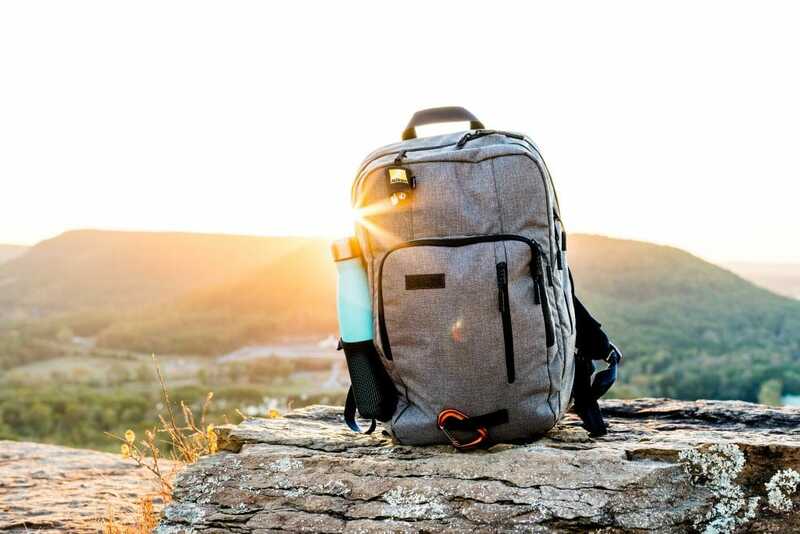 Your emergency kit should fit in a backpack, should you need to hike out to safety. Every emergency pack should have a first aid kit, matches, knife, flashlight, batteries, portable water filter, multi-tool, water jug, and non-perishable food. Customize your emergency kit to fit your needs based on where you’re going and for how long. A power inverter is absolutely critical when truck camping. It allows you to convert battery power into usable power for your household items. You can plug it into a power socket or wire it directly to the battery itself. Make sure your inverter has enough power and outlets for your devices. If you’re only charging a phone or running a laptop, you can plug a small inverter directly into a power socket, like a cigarette lighter. If you need to run power tools or an electric hot plate, you’ll need a higher wattage inverter connected directly to your battery or existing power wire. Always consult with a mechanic when making electrical modifications to your truck. A cozy place to lounge is a must-have after a long day of driving or hiking. Bring a comfortable camp chair for each person in your group, or hang a hammock between two trees for ultimate relaxation. It’s important to have shade wherever you camp, especially during hotter months. If you don’t have enough storage space to pack a canopy, consider installing a lightweight, easy to use awning on your vehicle. Are you ready to start truck camping? Tell us about your setup, and leave a comment to let us know if we’ve missed any essentials. 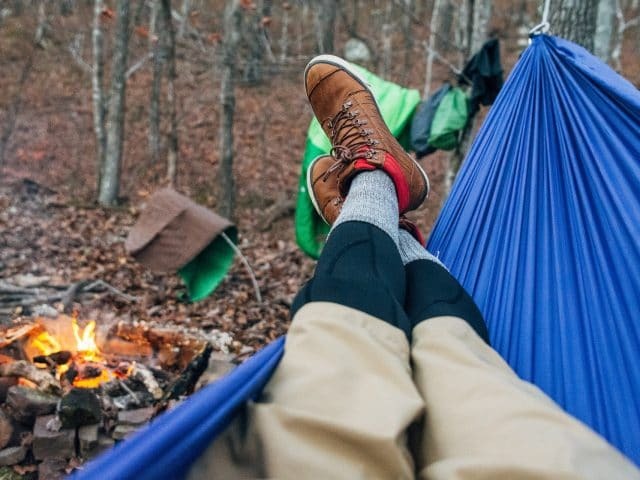 Guide to Camping for Free in the U.S.